Great Taste, organised by the Guild of Fine Food, is the acknowledged benchmark for fine food and drink. It has been described as the 'Oscars' of the food world and the 'epicurean equivalent of the Booker prize'. We are so excited to have been selected as a Great Taste Winner for 2017. After hundreds of hours of blind tasting by 500 food critics, our marshmallows were awarded the prestigious Great Taste honour building confidence and commercial success to a small businesses locally, regionally, nationally and internationally. 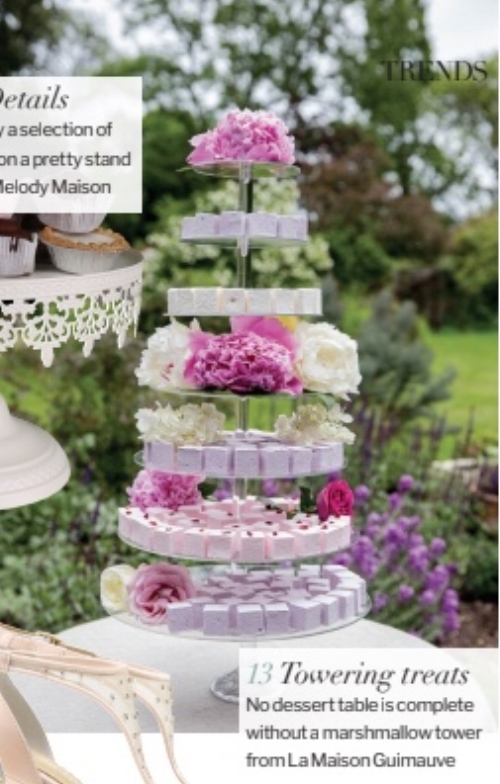 We are delighted to be the Peggy Porschen exclusive marshmallow supplier. Check out her pretty London Parlour for an exciting range of cakes and marshmallows of course! Click here to see And So to Wed's feature of the All Things Bright and Boho photo shoot which took place with some of the top names in the wedding industry in the south of England. It was such a pleasure to be invited to take part in the Moroccan styled shoot. Provides lots of ideas for you when planning your wedding. We are delighted to have been hand-picked by Rock My Wedding the UK's most influential brand in the wedding industry, as one of their exclusive suppliers. Take a look at their awesome website here for wedding inspiration, tips, advice and contacts. We are also proud to be part of the curated directory, Little Book For Brides. They bring honesty, authenticity and elegance with a touch of Love My Dress Glamour. Take a look at their website for inspiration. We took part in a stunning photoshoot with a talented team led by the wonderful Kate Cullen which was then published in Magnolia Rouge, a New Zealand based wedding blog and magazine synonymous with romance and style. You can see our marshmallows beautifully styled here. The same team were then featured in a 4 page spread in the May 2017 issue of Wedding Ideas Magazine. Take a look at Hitched for stunning wedding styling ideas. 'This is a gorgeous fresh marshmallow... really squidgy and soft... it would be really delicious (toasted over a fire)... You can have it camping or at the end of a meal, as a petit four...' - Rebecca Seal, Channel 4 Sunday Brunch Food Critic, journalist and chef. 'Imagine doing that over a fire (toasting), really delicious ...' - Michaela Strachan, well-known TV Presenter. Thanks to Glutenfreealex for her review of our marshmallows. Check out her blog which is really worth a visit.